Implantable dual-spiral antenna, Coplanar waveguide method (CPW), Industrial, Scientific and medical (2400 MHz to 2480 MHz), Bio-medical application. Implantable Medical Devices (IMDs) are used nowadays to perform an expanding variety of diagnostic and therapeutic functions . Bidirectional telemetry between the implantable medical device and exterior monitoring/control equipment is most commonly performed wirelessly, by means of an integrated implantable antenna. Implanted antennas are important parts of the devices used for biotelemetry, i.e., biomedical wireless communication, to transfer physiological information such as blood pressure, cardiac beat, hyperthermia etc., aiming to provide highly precise diagnostic information for prevention and/or timely treatment of diseases . The performances of the antennas implanted in the body or positioned on it are of fundamental importance in the validity and accuracy of the transmitted information that will reflect on the quality of the diagnosis and treatment in turn. The design of implanted antennas is subject to additional challenges that reflect both in the link budget, due to high loss, and corrosion in time, due to the harsh environment surrounding the transmitter . For bio-medical applications, medical implant communications service allotted certain bandwidth for operation i.e.) 402-405 MHz [4,5]. Implantable antenna provides a better means of communication from human body. The ever advancing miniaturization of electronic devices is leading to the making of various personal information and communication appliances which can be attached to (or) implanted inside the bodies of patients [6-8]. One of the important design aspects of an IMD (Implantable medical device) is the transmitter as the specification determines if it will be able to operate in a ISM band is in the range of 2400-2480 MHz [9-12]. Implantable antennas are electrically small antennas similar to typical antennas used for common wireless applications such as mobile phones, but with the additional complication that the implant will be located in a complex lossy medium . Most of the research on implantable antennas for medical purposes has focused on therapeutic applications such as hyperthermia, balloon angioplasty, etc. or on sensing applications. In both cases, the antennas works in its near field and propagation over a certain distance is not an issue . In biomedical telemetry applications on the other hand, the system is unlikely to be in the near field therefore it should have the capacity to transmit data over a longer distance. In this case, features like the radiation efficiency and the bandwidth are essential in order to provide transmission over a large enough range with a high enough data rate to be able to operate in wider environments like those experienced in the day-to-day life of the user. CPW feeding method  is used to simplify the fabrication and to reduce the radiation loss. The radiation characteristics of tissue implantable antenna mounted over human body is simulated and analysed. 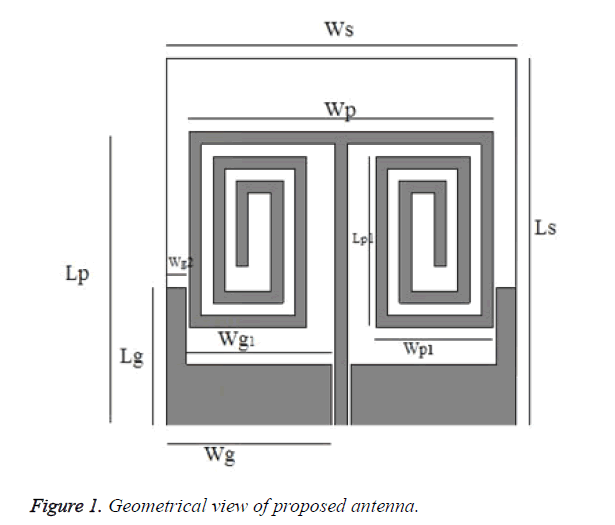 The geometrical view of proposed antenna is shown in Figure 1. The proposed antenna is designed with the substrate of bio-compatible alumina ceramic (Al2O3) substrate εr=9.9; tanδ=0.0002 with the thickness of 1.6 mm. Figure 1. Geometrical view of proposed antenna. A parametric model of a skin, fat and muscle are designed as per the electrical properties of human tissues. Table 1 shows the electrical properties of skin, fat and muscle. The thickness of the human tissues is shown in Figure 2. Antenna design with phantom model is designed which is shown in Figure 2. Figure 2. Proposed antenna measurement setup model. Table 1. Electrical properties of tissues. The following results are obtained from CST software and the simulation of proposed implantable antenna. The results of parametric studies of proposed antennas are measured such as return loss, Voltage Standing Wave Ratio (VSWR) current distributions and radiation patterns. The same properties are measured for phantom model. 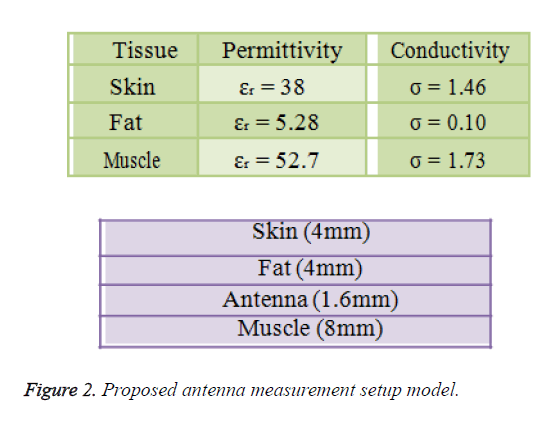 The radiation characteristics of proposed antenna and radiation characteristics of tissue implantable antenna mounted over human body phantom is presented in Figure 3. The return loss value of the proposed antenna is -36 dB at 2.41 GHz. The value of return loss for human phantom model is -26 dB at 2.41 GHz as shown in Figure 4. Figure 4. Return loss of proposed antenna with human phantom. 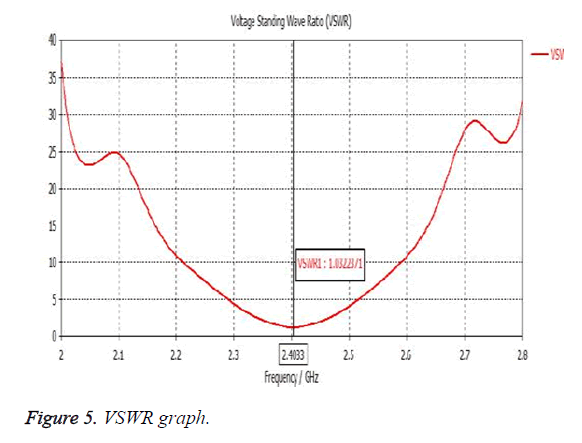 Voltage Standing Wave Ration (VSWR) is the ratio between maximum voltage and the minimum voltage along transmission line. The VSWR can be derived from the level of reflected and incident wave. The value of the proposed antenna is 1.05 so 90% power is transmitted. The VSWR graph is shown Figure 5. The radiation patterns of the dual-spiral antenna were measured and it shown in Figure 3. 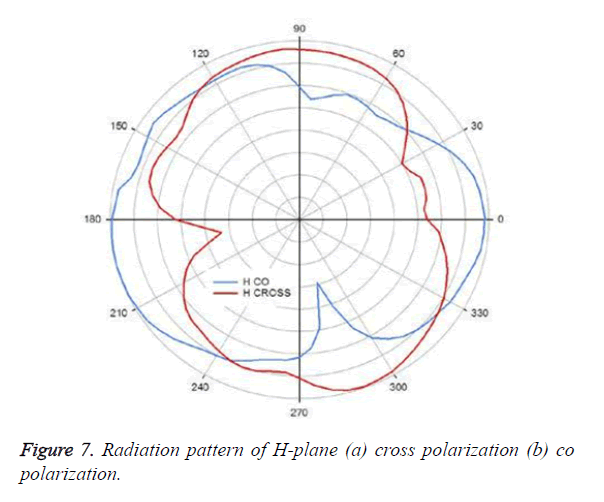 The E-plane of the proposed antenna with cross polarization and co polarization is shown in Figure 6 and H-plane with cross polarization and co polarization is shown in Figure 7. Figure 6. 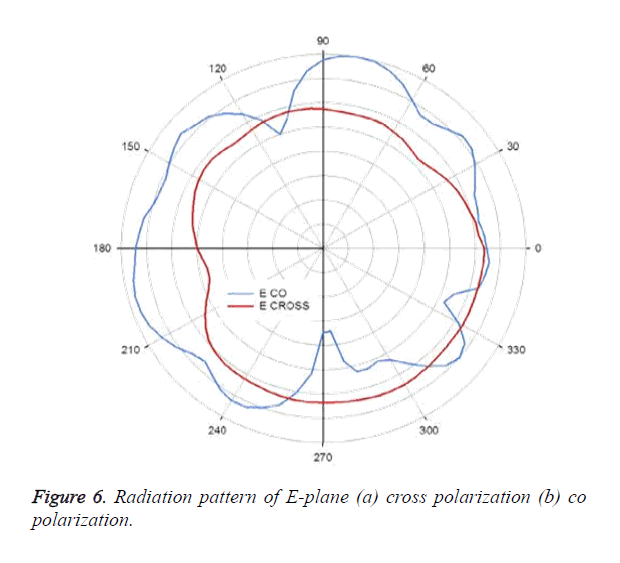 Radiation pattern of E-plane (a) cross polarization (b) co polarization. Figure 7. Radiation pattern of H-plane (a) cross polarization (b) co polarization. The total radiation efficiency of the proposed antenna is -8.131 dB and the value of directivity is 4.8 dB in isotropic view. So it has higher directivity than other implantable antenna. Figure 8 depicts the simulated EM characteristics and current distribution of the proposed antenna at 2.45 GHz. An implantable dual-spiral antenna for ISM band bio-medical application is presented with a compact size of 30 mm × 1.6 mm was designed to resonate at 2.41 GHz. Human body influence is studied and simulations and results were carried out with a human tissue model. CPW fed ground planes and high impedance has their own merits and their physical structure makes them to suitable for bio-medical application at 2.41 GHz. The CPW fed has the advantage such as to simplify the fabrication and reduces the radiation loss. The alumina ceramic substrate increases the influence of body parameter and shows the less dispersion of biological tissues. The proposed antenna shows the lower return loss, good impedance matching and high gain compared to other implantable antennas. The proposed methodology is used for several implantation scenarios and ISM band applications. Crumley GC, Evans NE, Burns JB, Trouton TG. On the design and assessment of a 2.45 GHz radio telecomm and system for remote patient monitoring. Med Eng Phys 1999; 20: 750-755. Ashok Kumar S, Shanmuganantham T. Design and development of implantable CPW fed monopole U slot antenna at 2.45 GHz ISM band for biomedical applications. Microw Opt Tech Lett Wiley Blackwell US 2015; 57. Scanlon WG, Evans NE, Burns JB. 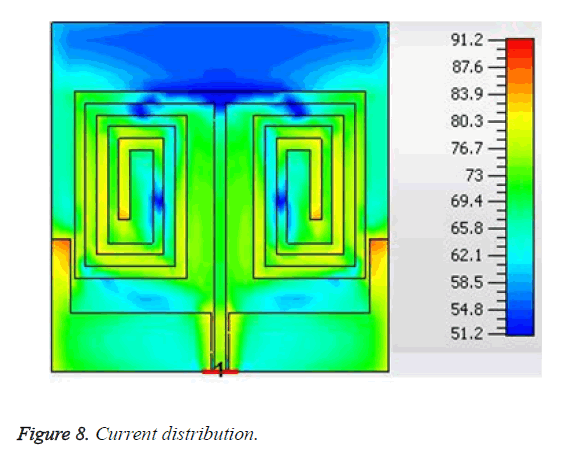 FDTD analysis of close-coupled 418 MHz radiating devices for human biotelemetry. Phys Med Biol 1999; 44: 335-345. Soontornpipit P, Furse CM, Chung YC. Design of implantable microstrip antenna for communication with medical implants. IEEE Trans Microw Theory Tech 2004; 52: 1944-1951. Pichitpong S, Cynthia MF, You CC. Design of implantable microstrip antenna for communication with medical implants. IEEE Trans Microwave Theor Tech 2004; 52. Ashok Kumar S, Shanmuganantham T. Implantable CPW fed circular slot antennas for 2.45 GHz ISM band biomedical applications. J Circ Sys Comp World Sci Publ Co PTE Ltd Singap 2015; 24. Ashok Kumar S, Sanmuga Sundaram R, Shanmuganantham T. CPW-fed small metamaterial inspired antenna for WiMax and WLAN applications Indian Antenna Week 2016 (IAW 2016). Thiyagarajar Coll Eng 2016. Jaehoon K, Yahya RS, Jaehoon K, Yahya RS. Implanted antennas inside a human body: simulations, designs, and characterizations. IEEE Trans Microwav Theor Tech 2004; 52. Karacolak T, Hood AZ, Topsakal E. Design of a dual-band implantable antenna and development of skin mimicking gels for continuous glucose monitoring. IEEE Trans Microwav Theor Tech 2008; 56: 1001-1008. Xia W, Saito K, Takahashi M, Ito K. Performances of an implanted cavity slot antenna embedded in the human arm. IEEE Trans Antennas Propag 2009; 57: 894-899. Asimina K, Jorge RC, Carlos AF, Konstantina SN. A Broadband implantable and a dual-band on-body repeater antenna: design and transmission performance. IEEE Trans Antennas Propag 2014. Ashok Kumar S, Shanmuganantham T. Design an implantable CPW fed dual dipole antenna for dual band biomedical applications. Int J Biomed Eng Technol Indersci Publ 2014; 14: 46-59. Ashok Kumar S, Shanmuganantham T. CPW fed monopole implantable antenna for 2.45GHz ISM band applications. Int J Electr Lett Taylor Francis UK 2015; 3: 152-159. Kiourti A, Christopoulou M, Nikita KS. 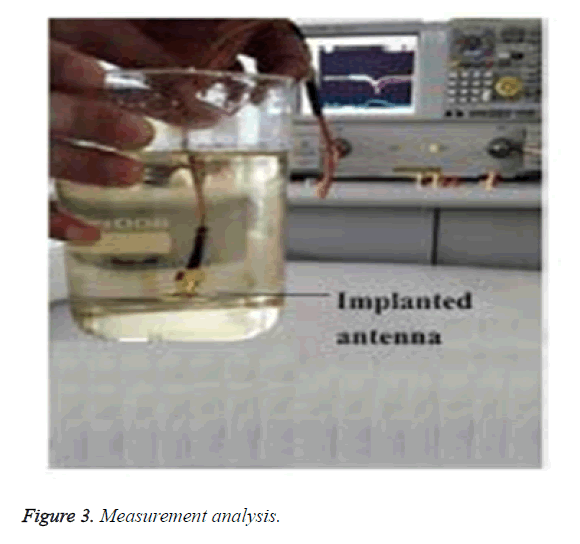 Performance of a novel miniature antenna implanted in the human head for wireless biotelemetry. Proc IEEE Int Symp Antennas Propag Spokane Washington 2011; 392-395. Ashok Kumar S, Shanmuganantham T. Design of implantable CPW fed monopole antenna for ISM band applications. Trans Electr Electron Mater Korean Inst Eng 2014; 15: 55-59.